In his book, The Applause of Heaven, Max Lucado describes the modern day “High D” personality. This man is headed for destruction. His life will only be a vapor — if he doesn’t slow down! In this day of the quick cash and the mad dash we are seeing more and more people living in the Mess of Stress! Someone has observed that this generation can be described in three words — hurry … worry … bury. Americans are becoming hypochondriacs. We consume in the neighborhood of five million pounds of aspirin per year, not counting all the aspirin-like products, plus sleeping pills, pain pills, and pep pills. The American Heart Association estimates that 55 million American adults and 2.7 million children have high blood pressure. Certainly this is not as it should be. We are living in a day of unprecedented stress and strain. There are thousands of self-help books on the market with winning ways of dealing with the Mess of Stress. This week’s verse talks about the right perspective we must have in the midst of trying and troubling times. The word translated anxiety is a reference to more than simple worry or frustration. It carries with it the idea of being overwhelmed, overcome, or controlled by something. It has an absoluteness to the worry. Yes, what Paul is warning against is the debilitating state that can come through the over consternation of circumstances. 1. Declare our faith. We must admit that we know that God holds all things together and is never caught off guard by our circumstances. 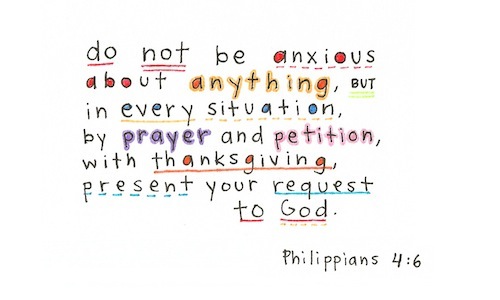 Don’t be anxious at all. 2. Describe our need. Never hesitate to talk to God about all that is troubling you. Talk plainly to Him as you would to your best friend. God alone is able to cause you so see clearly in the midst of your concern. Go to God in prayer. 3. Decide to trust. In every situation in life we make the choice to trust or forsake God. Make the deliberate determination to trust God in any and all situations. Be thankful that God knows all things and hears our requests.